Tom is an experienced civil litigator that focuses his practice on insurance defense, personal injury, and commercial litigation. Since law school, he has focused exclusively on civil litigation and is dedicated to obtaining the best results for his clients. 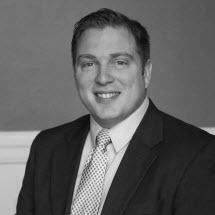 Tom has handled every aspect of litigation from discovery and depositions to motion practice, trial and appeals. He is well versed in the nuances of New York law with respect to procedure, liability and damages in civil litigation. Tom has defended individuals, businesses, self-insured entities and insurance carriers in a wide range of matters ranging from a traditional slip and fall to complex products liability claims. He has obtained favorable resolutions of matters on behalf of his clients through motion practice, arbitration, mediation, and direct negotiations with opposing counsel. During law school, Tom worked as an instructor and tutor helping prepare aspiring law students for the Law School Admissions Test and high school students for their SAT exams, and found it extremely rewarding to help these students reach their goals. Tom resides in Grand Island with his wife, Ashley, and son, Angelo, where he is an active member of the community. In his free time, Tom is an avid golfer and Buffalo sports fan.